As soon as I read this weeks assignment my first thought was of the first Superman movie starring Christopher Reeve. League member Las Vegas Yankee beat me to the punch, but I thought I would still give my two cents. Especially, since this week marks the 75th anniversary of the character. Superman: The Movie was everything a comic book super hero movie should be. A faithful recreation of the Jerry Siegel and Joe Shuster creation. Perfectly cast and truly making you believe a man could fly. The John Williams theme is one of my all time favorite pieces of composer. Whenever I hear it I instantly become empowered as if I were Superman himself. My super cool, yet non-geek wife and I even used it as our bridal party introduction theme song. Our guest thought it was the coolest and original idea ever. 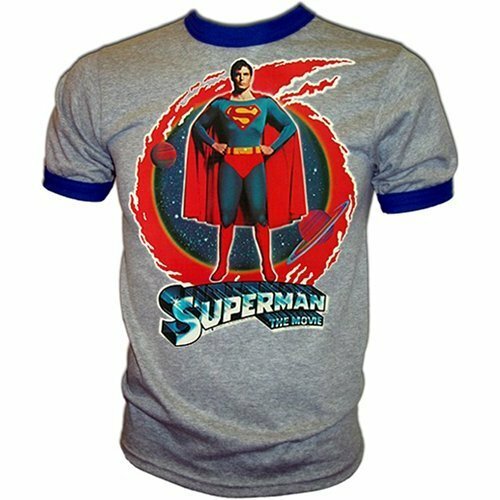 I remember the night I my Dad took to me to see the film at Las Vegas Fox theatre vividly and me sporting a Superman: The Movie T-shirt. 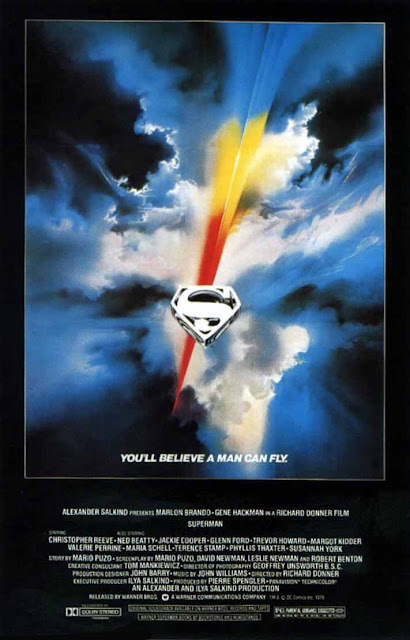 For me Superman: The Movie is not only one of the best comic book super heroes of all time, but one of the best films of all time. After seeing this weeks release of the Man of Steel trailer those feelings I had as a child came rushing back. It is my hope that when I actually see the new film I will be transported back to 1978 and have that childhood wonder be re-activated. If you haven't seen the new trailer check it out below. Agreed. In fact I just watched on Youtube the documentary look up in the sky! The first Superman movie is majestic. This new one...I can confidently say...not so much. You never know Hobby. I am looking forward to see what the new one has to offer, but sometimes you just can't beat the original. That's awesome JBoy. We played the Throne Room theme from Star Wars after we were pronounced husband and wife. I had a big hand in the music that was played that day. The Fox Theater in Las Vegas? Seriously? I believe they had just shut that place down when we moved to Vegas. I saw many important movies at that theatre. Raiders of the Lost Ark and Superman II to name a couple. I believe it closed down sometime in the mid to late 80's. I remember seeing that first Superman movie with my cadet camp buddies after we had spent two weeks in training. I was totally captured in the magic of this character I love so much. I remember thinking over and over how great it was and had hoped for a Batman movie to come soon after that was equally cool, but had to wait 11 years for that to happen. That's movie greatness for me Colin. When a movie invokes that kind of emotion it's inspiring.